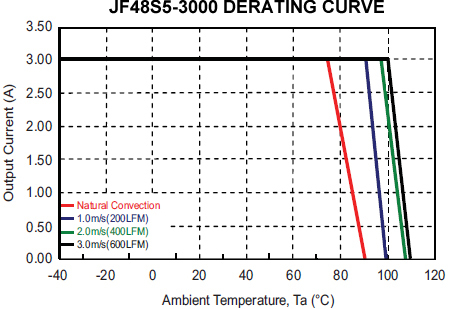 The JF series of DC DC Converters provides 15 Watts of output power in a low profile industry standard package and footprint. 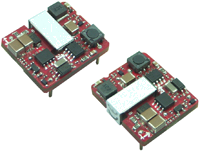 These converters have single outputs and operate over 2:1 input voltage ranges of 18-36VDC and 36-75VDC. These units are also protected against short circuit, over current, over voltage, and input under voltage conditions. Some features include high efficiency up to 88%, adjustable output voltage, and positive or negative remote ON/OFF control. These converters are RoHS compliant and have UL60950-1, EN60950-1, and IEC60950-1 safety approvals. 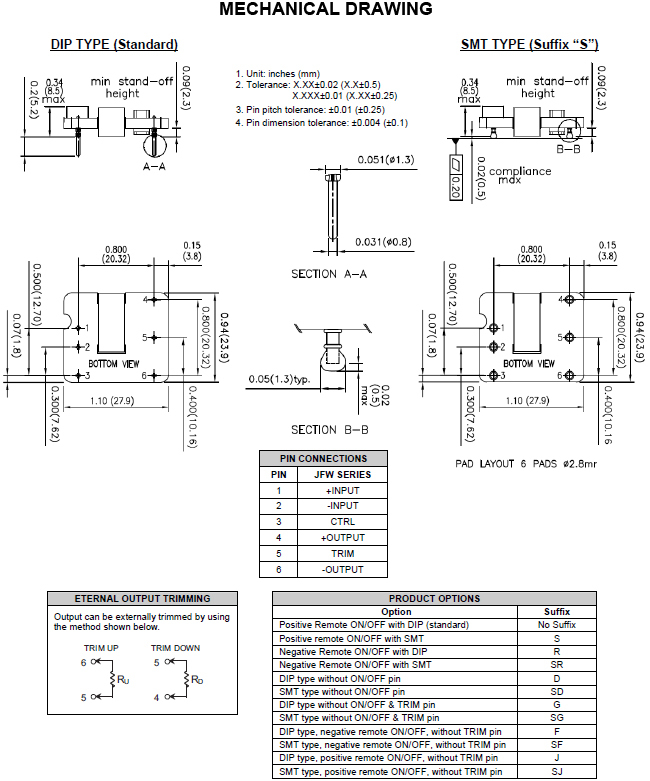 Both surface mount (“S” suffix) and DIP (standard) packages are available. Dimensions: 1.1in. × 0.94in. × 0.34in. Notes: 1. BELLCORE TR-NWT-000332. Case 1: 50% Stress, Temperature at 40°C. (Ground fixed and controlled environment). 2. Trimming allows the user to increase or decrease the output voltage set point of the module. This is accomplished by connecting an external resistor between the TRIM pin and either the +OUTPUT pin or the -OUTPUT pin. 3. The CTRL pin voltage is referenced to -INPUT. (See data sheet for more details). 4. The JF Series meets EN55022 class A and class B only with external components connected to the input pins of the converter. 5. An external filter capacitor is required if the module has to meet EN61000-4-4 and EN61000-4-5. The filter capacitor suggested is Nippon chemi-con KY Series, 220µF/100V, ESR 48Ω. 6. To order the surface mount version add the suffix "S" to the model number. 7. Other suffix options are available. Please see the data sheet for more details. 8. CAUTION: These power modules are not internally fused. An input line fuse must always be used.